At the beginning of his turn, Liao Hua has an additional action phase. Single Use Ability: When Liao Hua is on the brink of death, he can choose to flip his character card and return with X units of health, X being the number of countries in the game. The extra action phase that Liao Hua gains in "Vanguard" occurs before his judgement and drawing phases. If Liao Hua is the target of Capture, the extra action phase granted by "Vanguard" is conserved and it occurs before the judgement card is flipped. Liao Hua can Attack during each of his action phases. The commonly misnamed 'one attack per turn' rule should be called the 'one attack per action phase' rule. If Liao Hua plays Lightning in the extra action phase granted by "Vanguard," he must flip a judgement for this card during his judgement phase. When a character is on the brink of death, everyone who is in play is prompted for a Peach to save the dying character. This process starts with the character who is taking their turn when the brink of death is reached and it goes to the right around the table. Liao Hua must choose to activate "Aspiration" when it is his turn in this process. This means that he cannot wait to see if other characters to his right have a Peach before using his power. When "Aspiration" is activated, X is determined by how many countries are represented when Liao Hua activates the power on the brink of death, not by the number of countries that were represented at the beginning of the game. In other words, if all characters from a particular country are dead when "Aspiration" is activated, that country is not counted in X. When "Aspiration" is activated, note that Liao Hua does not regain X units of health, but he returns to a health level of X. In other words, if Liao Hua is Attacked with Wine when he has one unit of health, he still returns to a health level of X, not a health level of X - 1 as one might intuitively think. 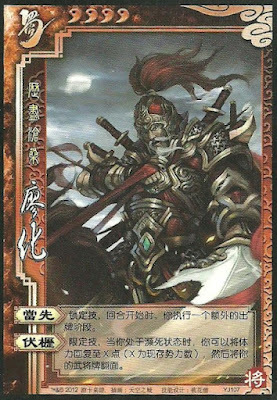 Liao Hua's "Vanguard" gives him somewhat of a defense against Capture if he has Attack and Peach cards to use in the initial action phase. Liao Hua's "Vanguard" allows him to do a 'one-two punch' if he has the right cards. Liao Hua can Attack in the initial action phase to possibly draw out a character's last Escape, then he can Attack them with Wine in his normal action phase for additional damage. Liao Hua's "Aspiration" and the fact that he is such a weak character gives him a surprising amount of longevity in his games, as most players do not bother to pursue him. Liao Hua is a very weak character. "Vanguard" gives him defense against Capture and it allows him to Attack an additional time each turn, but there are characters who have similar and better abilities. While "Vanguard" does help Liao Hua against Capture, it is not a perfect defense. The first action phase happens before his drawing phase, so if the judgement fails, Liao Hua is unable to use the cards that he drew for that turn. If Liao Hua does not have any cards that he can use for the first judgement phase granted by "Vanguard," this ability is essentially useless since he cannot do anything until he draws two cards in his action phase. When using him, one finds that this happens more often than not. Liao Hua 's "Aspiration" gives him longevity if there are many countries in the game when he is placed on the brink of death, but he comes back with his character card flipped. If he has few or no cards, he can lose the remaining units of health very quickly. Cao Pi - Cao Pi's "Exile" allows him to flip Liao Hua face up when he is flipped face down from "Aspiration," allowing him to return to the battle more quickly. Liu Bei/Chen Gong/Xun Yu/Guo Jia/Xu Shu - These characters can either give Liao Hua cards or allow him to draw cards. This is useful for activating Liao Hua's 'one-two punch' as described in the advantages section. Ma Dai - Ma Dai's "Sneak Attack" can be used to lower Liao Hua's maximum health level. This can greatly impede his "Aspiration" when he activates this power if his maximum health level is lower than X. King Liao Hua may be able to win as the king due to his longevity, but he needs amazing loyalists to do all of the fighting. Without strong loyalists, Liao Hua will simply 'exist' as the rebels tear him apart. Loyalist Liao Hua is a poor loyalist pick. He does not have many good offensive options to kill rebels and his longevity means very little since he will not be the main target of the enemies. Rebel Liao Hua is a poor rebel pick. While he will more than likely be the last rebel standing if his team is at a disadvantage, he has few options for damaging the king or providing help for his team. Spy Liao Hua does not make for a good spy. While he does have longevity, he will have a hard time turning the tide of the battle if one team gets an advantage over the other. It is difficult to image why YOKA would release such a weak and boring character. He does not even seem to be worth the ink that was used to create his playing card. There really is nothing he can do that another character cannot do better. For example, do you want to Attack multiple times per turn? Zhang Fei, Tai Shi Ci, Gao Shun, and even Cao Zhang can do this better than Liao Hua. Do you want to survive for a long period of time? Zhou Tai, Pang Tong, Yu Jin, and Hua Tuo have better defensive abilities than Liao Hua's "Aspiration." Do you want to use a character who has a defense against Capture? Try Lu Xun, Jia Xu (two out of the three Captures in the standard deck are black), Zhang He, and Sima Yi. Most experienced players would not even waste a Capture card on Liao Hua because he is so weak that the card would be better used on a more formidable enemy. If you are using Liao Hua (and quite frankly, we cannot see why you would), try to save up Attack cards for the 'one-two punch' described in the advantages section. This technique really is not all that powerful because experienced players would probably see through this tactic and save their only Escape card for the second action phase, but it seems to be the only strategy that Liao Hua can employ.